In large bowl, beat all Cake ingredients except bittersweet chocolate with electric mixer on low speed 1 minute, scraping bowl constantly. Increase speed to medium; beat 2 minutes. Stir in bittersweet chocolate until well combined. Pour into pan. Bake 45 to 55 minutes or until toothpick inserted in center comes out clean. Cool 15 minutes; turn upside down onto cooling rack or heatproof serving plate, and remove pan. Cool completely, about 1 hour. Place cake on serving plate. In medium bowl, beat butter and strawberry preserves with electric mixer on medium speed until smooth. Add powdered sugar, and beat until smooth. Beat in buttermilk. Pour over cake. Garnish with strawberries. Swap out the strawberry preserves for your favorite fruit preserves. This cake can be made using Betty Crocker™ Gluten Free chocolate cake mix. Make and bake as directed. As always, make sure all the other ingredients you use are gluten free. 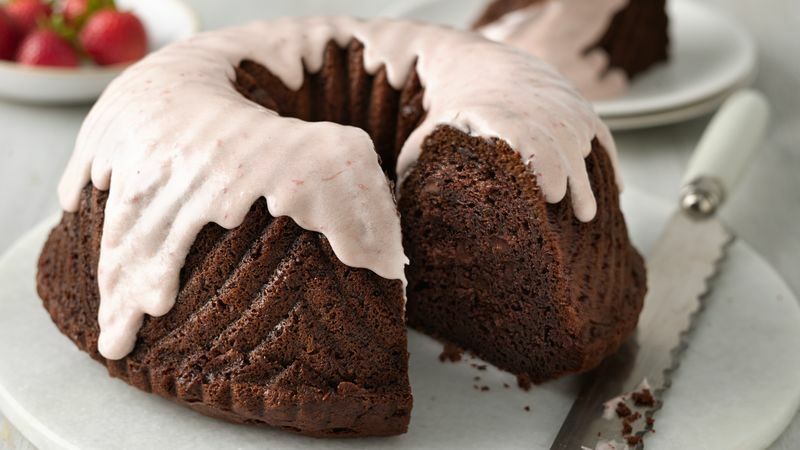 This cake was photographed using a bavaria bundt pan. Deeper pans like the bavaria pan may require an additional 2 to 7 minutes of bake time.